A must-read for generations of book lovers, this remarkable prequel to the classic Anne of Green Gables was specially authorized by L. M. Montgomery's heirs to celebrate the 100th anniversary of the publication of the original novel. 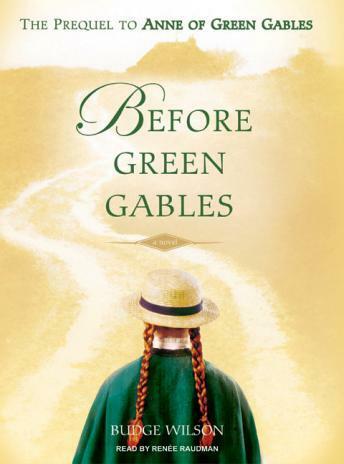 Before Green Gables is the story of Anne Shirley's life before her arrival at Green Gables-a heartwarming tale of a precocious child whose lively imagination and relentless spirit help her to overcome difficult circumstances and of a young girl's ability to love, learn, and above all, dream. Published in 1908, L. M. Montgomery's coming-of-age classic Anne of Green Gables has enchanted generations of readers, both children and adults. The story of the spunky red-haired orphan from Prince Edward Island is known to millions, and copies of the eight titles in the series have never gone out of print. But when readers first meet Anne, she is only eleven and has just been sent from an orphanage to meet her new family. No one ever knew the events of Anne's life before she arrived at Green Gables. Until now. For the millions of readers who devoured the Green Gables series, Before Green Gables is an irresistible treat: the account of how one of literature's most beloved heroines became the girl who captivated the world.